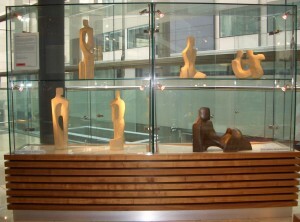 John Brown’s Sculpture on display at Tower 42 (formerly NatWest Tower) in the City of London. For the next three months, until 16th January 2018, a selection of my sculpture will be on display in the first floor lobby of Tower 42, Old Broad Street, London EC2N 1HN, the seventh-tallest building in the UK formerly known as the NatWest Tower which was designed by Richard Seifert in 1981. This complements others of my sculptures which are sited in various properties in the City. The sculptures on display include five stone carvings in Ancaster stone and a reclining figure in bronze resin. All these are suitable for corporate settings – desktops, boardrooms or reception areas. The stone carvings, all in Ancaster limestone, include a group of three, entitled ‘The Conversation’ and can be purchased individually or as a group. The other two stone sculptures are ‘Attention ll’ and ‘Play’. Ancaster Limestone has been selected for its unique qualities in order to enhance the particular sculptural forms. It has a soft creamy colour with darker subtle striations which look well in many settings. The bronze resin piece, ‘Reclining Figure’ is one of an edition of 12, a cast taken from the original stone carving. A flexible rubber mould was taken from the original stone, then it was studio cast by a professional caster to simulate traditional materials using finely ground metals. These are combined with epoxy resin and reinforced to give a strong and durable sculpture. The result resembles foundry cast metal, but is lighter in weight and less expensive, making it more affordable for many clients than foundry cast bronze. ‹ Sculpture Hire for Weddings, Parties, and Special Occasions.